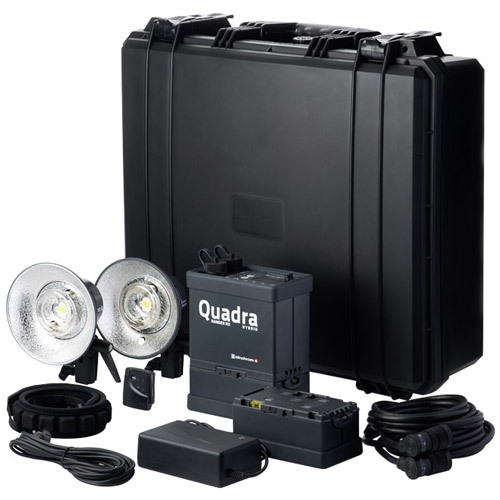 The new Ranger Quadra Hybrid AS RX is a compact portable 400Ws battery flash system for studio and outdoor use. Complete with fast recycling times, wireless trigger and remote options via the EL-Skyport, the Quadra Hybrid is the perfect system for anyone who likes to work away from a main power source. Elinchrom's latest firmware manages flash power consistency, remote power variation, LED modelling lamps and even more RX features than are currently available on any other unit. The choice of the battery is up to the you: Lead-Gel batteries for low-temperature robustness, or Lithium-Ion batteries for light weight and high flash capacity. With the Lithium-Ion battery included in this kit, the whole pack only weighs 2kg and allows you ~320 flashes at full power while being an incredible 15 x 8.5 x 18cm. Two heads are available for the RQ system: an A (Action) head for action freezing flash durations and an S(Standard) head for general purpose photography. The Action heads in this set are ideal for sport photography, fashion photography and Action Freezing photography.